Arizona sand has been used for testing filtration, automotive, and heavy equipment components for decades. A variety of names have been applied to Arizona sand including Arizona Road Dust, Arizona Silica, AC Fine and AC Coarse Test Dusts, SAE Fine and Coarse Test Dusts, J726 Test Dusts, and most recently ISO Ultrafine, ISO Fine, ISO Medium and ISO Coarse Test Dusts. Many military and industrial specifications require use of Arizona Test Dust and refer to one or more of the above names. This report will attempt to describe particle size differences and provide a brief history of Arizona Test Dust use dating back to 1940. Raw Material: The material shall be dust that settles out of the air behind or around tractors or implements operating in the Salt River Valley, Arizona. It is recommended that this dust be caught on a canvas cloth. Screen Analysis (By Weight)80 per cent through 270 mesh screen. 20 per cent through 200 mesh screen, but shall be retained on 270 mesh screen. First: The requirement of air floating results in dust is in every way comparable with that entering the air cleaner of a tractor when operating in a field, since the position of the air inlet is such that the greater part of the dust entering the tractor inlet is actually air floated. Second: The specifications of sieve size were arrived at by analyzing samples of dust caught in the oil cups of a number of cleaners operating in the extremely dusty conditions in the Southwest. Formulation of Arizona Test Dust by collecting wind blown topsoil, which required screening and blending, became impractical as larger quantities of test dust were needed. It is also conceivable that significant variation in particle size of wind blown dusts would occur as a result of changing weather conditions. During the early to mid 1950’s, General Motors Corporation developed a procedure using ball mills, elutriation, and blending to manufacture test dusts. AC Spark Plug division of General Motors Corporation process specification number 2323 describes the production process procedure to produce AC Standardized Air Cleaner Test Dust, Coarse Grade, Part Number 1543637. It outlines a process where 100 pound lots of Arizona Sand are ground a specified number of revolutions in a ball mill containing steel balls. Excess fine particles generated during the milling process are removed using an elutriation process in water. The coarse material remaining is dried in an oven, remilled in a Fitzpatrick commuting machine and blended. Blending consisted of four milling batches resulting in a blended lot containing 400 pounds of test dust. Blended dust was analyzed to determine if specified particle size distribution was achieved. AC Spark Plug division of General Motors Corporation Process Specification Number 2322 describes the production procedure involving manufacture of AC Standardized Air Cleaner Test Dust, Fine Grade, Part No. 1543094. The procedure specifies a process where 100 pounds of Arizona sand is milled in a ball mill for a specified number of revolutions. Two mill batches were blended together to form a single 200 pound batch of dust. Blended dust was analyzed to determine particle size distribution. SAE Air Filter Test Code Subcommittee, SAE Filter Test Methods Subcommittee, Military Standards authors, and others adopted the above table to define particle size specifications relative to Standardized Arizona Test Dusts. Subsequently SAE Air Cleaner Test Code – SAE J726 Specification was updated to include particle size specification limits for test dust relative to the Leeds & Northrup Microtrac Analyzer. AC Spark Plug continued to use the Microtrac Analyzer until they ceased production in August 1992. During 1982, Powder Technology Inc. (PTI) began production of fine and coarse test dusts. PTI obtained raw material from the same Arizona supplier used by AC Spark Plug to avoid chemical composition differences. PTI processed test dust by using jet milling and air classification to control particle size. In 1982 the published SAE J726 Specification described fine and coarse test dust using the Roller Table. PTI therefore began production of SAE Fine and Coarse Test Dusts using particle size limits specified by the Roller Table and a Coulter Counter Model TAII instrument as means of particle size measurement. During the following decade, popularity of PTI produced test dusts grew due to product consistency, lower cost, and immediate availability. Some test dust users reported differences in testing performance when comparing AC Spark Plug and PTI produced test dusts. A task force to investigate differences between PTI and AC Spark Plug produced test dusts was formed by the SAE Air Filter Test Code Subcommittee. A report submitted by the task force dated June 1988 compared particle size of three samples each of AC Spark Plug Fine Test Dust, AC Spark Plug Coarse Test Dust, PTI Fine Test Dust, and PTI Coarse Test Dust. Several samples were analyzed by PTI using a Coulter Counter TAII instrument. The following table compares differential content of PTI Test Dusts with AC Spark Plug Test Dusts. Numbers below are expressed in percent by volume. Although no formally conducted performance comparison effort was organized, controversy involving differences in performance of test dusts manufactured by AC Spark Plug and PTI continued until March of 1992 when AC Spark Plug informed it’s customers and SAE Committees it would cease production of test dust. AC Spark Plug indicated the equipment used to manufacture test dust was wearing out and continuing formulation of test dusts was not profitable. With a backlog of orders and inability to produce test dust, AC Spark Plug hired PTI to produce several batches of fine and coarse test dust to satisfy existing orders. AC Spark Plug asked PTI to produce test dusts that would comply with AC Spark Plug particle size specification using the Leeds & Northrup Microtrac analyzer AC Spark Plug had been using since 1979. Three batches of AC Spark Plug Fine Test Dust, numbers 4396, 4401, and 4414, were produced. Three batches of AC Spark Plug Coarse Test Dust, numbers 4385, 4386, and 4412, were produced. Due to differences in production methods, the six batches of fine and coarse test dust listed above should be expected to perform differently than prior test dust batches produced by either AC Spark Plug or Powder Technology Inc.
April 1992, ISO/TC22 members approved new work item proposal N1712 Performance Testing of Filters – Definition of Test Dust. Later that year ISO/TC22/SC7/WG3 began work on a rough draft, which would evolve through stages of ISO Standard Development. Part 1: Arizona Test Dust was published, First Edition, 15 December 1997. It specifies four grades of test dust including dust description, designation, particle size distribution, particle size analysis procedure, and chemical content. The intent in producing a separate standard for the description of test dust was to provide a simple and accurate test dust reference for use in other standards or documents where test dust use is required. Future revisions of ISO 12103-1 will accommodate changes in technology affecting test dust manufacturing processes and insure product consistency for years to come. ISO 12103-1,A1 Ultrafine Test Dust is nominal 0-10 micron size. It was originally developed for testing automotive cabin air filters. Although it is not currently specified as a suitable contaminant for cabin air filters, it is used as a test contaminant for fuel system components, water filter performance evaluation, and other custom applications. 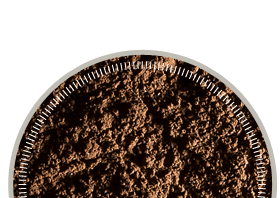 ISO Ultrafine test dust is a milled and classified product resulting in a sub micron content that is lower than that found in ISO 12103-1,A2 Fine Test Dust. ISO 12103-1,A2 Fine Test Dust is nominal 0-80 micron size. ISO Fine Dust is identical to SAE Fine Test Dust produced by Powder Technology Inc. prior to formation of this Standard. The basis for acceptable particle size limits specified per ISO 12103-1, A2 were derived from analysis of eight batches of SAE Fine Test Dust manufactured by Powder Technology, Inc. between 1992 and 1994. A view of volume differential particle size data indicates a bi-modal distribution with approximate peaks at 4 and 20 micron size. The bi-modal aspect of this product traces back to the original roller analysis specification of Fine Test Dust shown in former revisions of SAE J726 Specification. ISO 12103-1,A3 Medium Test Dust is nominal 0-80 micron size with a lower 0-5 micron content than ISO 12103-1,A2 Fine Test Dust. Medium Test Dust is identical to former SAE 5-80 Micrometer Test Dust specified in SAE J1858: Full flow lubricating oil filters multipass method for evaluating filtration performance (now relaced by ISO 4548-12). The basis for acceptable particle size limits specified per ISO 12103-1,A3 were derived from multiple samples of two prior batches of SAE 5-80 Micrometer Test Dust manufactured by Powder Technology Inc. Samples from only two batches were used because only two batches of this type dust were produced prior to 1994 when ISO 12103-1 particle size limits were determined. ISO 12103-1,A4 Coarse Test Dust is nominal 0-180 micron size. ISO Coarse Test Dust is identical to SAE Coarse Test Dust produced by Powder Technology Inc. prior to formation of this Standard. The basis for acceptable particle size limits specified per ISO 12103-1,A4 were derived from analysis of 8 batches of SAE Coarse Test Dust manufactured between 1992 and 1994. Many test dust users have expressed an interest in correlation between AC Spark Plug Fine and Coarse test dusts formerly manufactured by AC Spark Plug and ISO Fine and Coarse test dusts manufactured by PTI. Recent particle size analysis of AC Coarse, AC Fine, ISO Coarse, and ISO Fine Test Dust samples indicate differences, which could translate to variations in testing performance. The above two studies involve particle size data generated using a Leeds & Northrup Microtrac Model X-100 laser diffraction type analyzer. The Microtrac X-100 analyzer is capable of measuring particulates between 0.12 and 704 micron size. The principle of operation involves projection of a laser beam through a transparent sample cell containing a stream of moving particles suspended in water. Light rays, which strike particles, are scattered through angles inversely proportional to particle size. A photo detector array measures quantity of light (flux) at predetermined angles. Electrical signals proportional to measured light flux values are processed by a computer system to form a multi-channel histogram of particle size distribution. A secondary high angle lens system and photo detector gathers high angle scattered signal data from small particles. This data is merged with large particle signal data and correlated into a composite distribution. The Microtrac Analyzer was selected for this particle size comparison because it provides a rapid, repeatable means of comparing broadband distributions. Seven samples of ISO Fine Test Dust manufactured by Powder Technology Inc. and six samples of AC Fine Test Dust manufactured by AC Spark Plug division of General Motors were analyzed for comparison. The ISO Fine samples (formerly SAE Fine) selected are those previously used to determine particle size limits shown in ISO 12103-1 Test Dust Standard. ISO Fine batch ID numbers are 4377B, 4382A, 4400B, 4402B, 4422B, 4443A, and 4492B. Graph A indicates the cumulative volume spread of ISO Fine samples analyzed. AC Spark Plug Fine Test Dust samples analyzed were selected randomly and included batch ID numbers 054, 258, 520, 958, 1125, and 1472. Graph B indicates the cumulative volume spread of AC Spark Plug Fine samples analyzed. Eight samples of ISO Coarse Test Dust manufactured by Powder Technology Inc. and six samples of AC Coarse manufactured by AC Spark Plug division of General Motors Corp. were analyzed for comparison. ISO Coarse Test Dust samples (formerly SAE Coarse) analyzed are those used previously to determine particle size limits shown in ISO 12103-1 Test Dust Standard. ISO Coarse samples ID numbers 4420A, 4491E, 4445B, 4446C, 4452C, 4465B, 4491C and 4499C were analyzed. Graph E indicates cumulative volume spread of ISO Coarse Test Dust samples analyzed. AC Spark Plug Coarse Test Dust samples analyzed were selected randomly and included batch numbers 1418, 1474, 1484, 2071, 2507, and 2787. Graph F indicates cumulative volume spread of AC Coarse samples analyzed. ISO Coarse Test Dust sample analysis data was averaged, as was AC Spark Plug Coarse data. Graph G compares cumulative volume averages of ISO Coarse and AC Spark Plug Coarse. Graph H compares differential volume averages of ISO Coarse and AC Spark Plug Coarse Test Dusts. Review of Graphs E and F indicate less batch-to-batch variation in ISO Coarse samples as compared to AC Spark Plug Coarse samples. Graphs G and H indicate AC Spark Plug Coarse contains higher particle content below 2.75 micron and above 74 micron than ISO Coarse Test Dust. Inversely, ISO Coarse indicates higher particle content between 2.75 micron and 74 micron. The median particle size by volume of AC Spark Plug Coarse is 34.5 micron, whereas ISO Coarse median volume is 29.6 micron. Generally speaking, AC Spark Plug Coarse is slightly coarser than ISO Coarse Test Dust. Product testing performance differences could be expected if ISO Coarse and AC Spark Plug Coarse were used as part of the same test program. ISO Fine sample data was averaged, as was AC Spark Plug Fine sample data. Graph C compares the cumulative volume average of the two types of Fine Test Dust. Graph D compares differential volume averages of ISO Fine and AC Spark Plug Fine samples analyzed. Review of Graphs A and B indicate a narrower spread among ISO Fine Test Dust samples as compared to AC Spark Plug Fine Test Dust samples. From this, we may assume that test results accumulated using ISO Fine Test Dust should be more consistent over time than those accumulated using AC Spark Plug Fine Test Dust. Graphs C and D indicate significant differences in particle size between the two types of dust. There is an increase in particle content below 1.5 microns and above 9 micron size when comparing AC Spark Plug Fine Test Dust to ISO Fine Test Dust. Inversely, ISO Fine has an increase in particle content between 1.5 and 9 micron size. The median particle size of AC Spark Plug Fine Test Dust is 10.65 micron, whereas, ISO Fine median particle size is 7.01 micron. Significant differences such as these could translate to performance differences when testing some products.